Tantrums can be hilarious, in hindsight. At the time, I’ve wanted the floor to swallow me whole and spit me back out somewhere a long distance away from my children. But, I have to admit; sometimes I get it. As a self confessed tantrum queen (who doesn’t love a well timed strop?) I understand that overwhelming need (rage) to have my point of view heard. If I’m upset I can’t simply switch that off and pretend I’m fine…so why should I expect my children to? *prepares everyone a ‘sorry’ sandwich within the hour. Two weeks ago, my littlest one threw a humdinger. Part of me wonders if she got wind of the fact that I said in my last post that she was getting better and more level headed – ‘that’ll learn ‘er’ and all that. 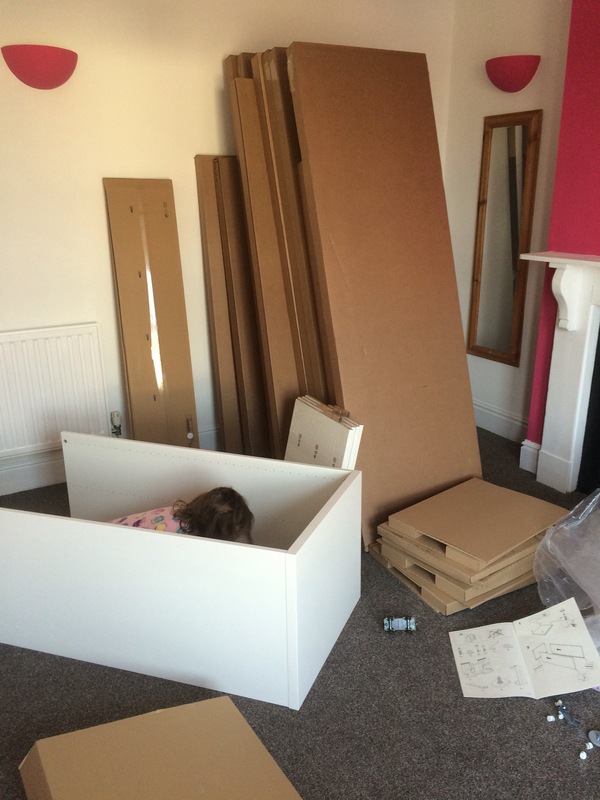 The day began with the scenario pictured below (yes, that is a small girl pretending the chest of drawers ‘*mid construction’was a rabbit hutch). Hellish, no? Hours and hours later, marriage still in tact (due to my husband’s suggestion that we order in a takeaway) our big girl’s new bedroom was complete. *abandoned while I had a brew and pratted about on Facebook and Twitter. She was over the moon. The new room we have talked about for two years was finally complete. And this was the first night she would be sleeping in it. Such was our excitement in enjoying this milestone with our middle child, we forgot something quite important. Our little one. Who is only two. We tried everything we could think of, patience, sternness, humour, ignoring, attention. Nothing worked. Only when it suddenly dawned on me – as I looked at the empty space where a little toddler bed had stood for her entire lifetime until that day – in her eyes, we had taken away her best friend. Suddenly I remembered the countless nights when, exasperated and withering, we’d told them to stop talking. Told them off for getting out of bed, sat in the room – physically between them as they hadn’t been trusted to be sensible. What was a time consuming annoying ‘parenting phase’ to us, was to her the most fun, silly and exciting part of her day. And we had taken it all away, whilst expecting her to be happy about it. “Do you want your sister to put your pyjamas on?” We got an angry nod. Finally – someone was listening. In came big sis, the little mummy she is, clucking and calling her sister ‘darling’ as she does in that hilariously patronising but undeniably endearing way. I had to stop myself from breaking down in a pool of tears as I watched this exchange. Husband looked up from scrolling on his iPhone long enough to roll his eyes at the sight of me welling up. She still cried herself to sleep. And I cried on the stairs. Not because I was frustrated at another horrendous bedtime. Not because I was exhausted or didn’t know what to do. I cried because I think I would have felt exactly the same as a little girl. Once upon a time, I was the baby sister. My big sister used to share a room with me despite the fact that she had her own room. I used to have dreadful nightmares as a child and I was terrified of the dark. I’ve no memory of how long she did this, but all the time I used to suffer with this, my big sis gave up her own precious space to make sure I wasn’t on my own. At a time when I would have sat up most of the night wide eyed in horror, convinced if I went to sleep something awful would happen; she was there. Somehow hearing her breathe steadily at the other side of my room, fast asleep, made me feel like nothing scary could ever occur. And after a while (I have no clue how long) the nightmares stopped and the fear subsided. How ironic, that after yearning for a ‘light on’ all night for most of my childhood, I now despise the sliver of light around my bedroom door as a mother. I can’t pretend I wouldn’t now love to sleep in pitch darkness and perhaps a small part of me hates to be reminded that I used to be so very afraid. I’ve left it two weeks before completing this post, for my guilt to ease and in the desperate hope that my little daughter would now realise she loves having her own room. She does, and skips off happily at the end of the day to her big girl bed..after a very prolonged and fond farewell with her sister. Apart from tonight, when they had a through-the-wall battle over a dog with a bell inside it. Yep, really. For the next episode of the Tantrum Tales, I have no doubt that I will return to my roots. And by roots, I mean a disastrous shopping trip and a mortifying outburst from one of my children. Keep thinking history is repeating itself you know!